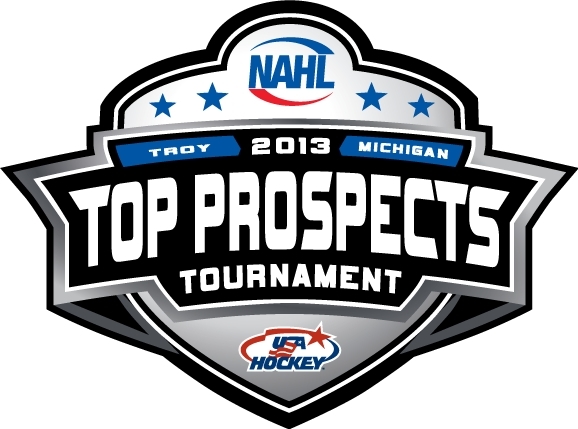 The NAHL Top Prospects Tournament will be held this upcoming Monday (2/18/2013) thru Wednesday (2/20/2013) in Troy Michigan. The event not only will bring the top talent in each division together to play a small tournament in front of scouts at the NHL and college level but the event will showcase all 17 teams in the NA3HL and host the NAPHL championship series. Dakota: Brookings, Minot, Bismarck, Austin, and Aberdeen. Frontier: Wenatchee, Kenai River, Amarillo, Fresno, Fairbanks, Minot (one of the goalies only). Midwest: Janesville, Coulee Region, Kalamazoo, Springfield, and Topeka. Texas: Amarillo, Texas, Wichita Falls, Corpus Christi, and Odessa. Great Lakes: Soo, Johnstown, Michigan, Port Huron, and Jamestown. 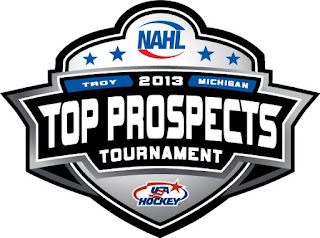 NAHL 18U Selects: Selected from entire league. The last line is why Amarillo and Minot have players playing on two different teams. Also it states in the press release that scouts will be paying close attention to those players recognized on the NHL Central Scouting Bureau's "Players to Watch" list for 2013 draft-eligible players. So who are those players? Well there's six of them and three come from our division. Beauvais is a smaller defensman standing at 5'11 but he is an offensive type of D-man with good speed. Could he be drafted this year in the NHL? Possibly, but because it's tier two hockey it probably wouldn't come until the later rounds. Lemirande is a player I've only seen play in person twice. That being said, the first thing you'll notice is his size, 6'4 220lb. For being a big guy he skates pretty well. He doesn't put up many points now so he'd probably not put up many points as a pro, but he shows great leadership and will do anything for his teammates. That along with his skating alone could probably give him a decent career in minor league hockey. Sabatni is still a young player at 18 years old. Stat wise this season he's a guy you'd probably just over look since it's not really that impressive. He did however play three games with the U.S. National Development team in the USHL. That alone is probably why he's on the scouts radar. 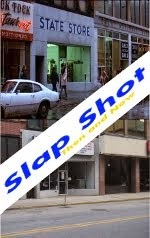 All games can been seen on fasthockey.com ($7.99 a game) or you can check up on live scores on NAHL.com. During last years tournament former Johnstown Tomahawks' player Gage Christianson played in all three games for the West team and lead them in scoring, 1 goal, 2 assists, with 3 points, and a +2. During the tournament will be giving you updates on how the Tomahawks representatives are doing. For the NAHL 18U team, Johnstown will have JB Baker playing for them and Jason Spence will be Co-Head Coach with Brookings head coach, Cory Laylin. For the Great Lakes team, Andrew McDonald, Cody Gylling, Mitch Kontny, and Casey Nelson will be representing Johnstown. The head coach will be Dan Daikawa from Jamestown and the assistant coach will be Bruno Bragagnolo, Soo Eagles. Former Johnstown Tomahawks' players that will also be in this years tournament, playing for the Midwest is Brandon Brossoit, and playing for team Texas will be Gage Christianson.